I have a confession to make. Often, while reading academic writing, my mind tends to wander; my eyes skip over the words. I can get to the end of a piece of writing and hardly be able to tell you anything I just read. I may make something up. Not so in this case. Warner’s language is clear and poetic. She leads you along an open forest path with sure footing and a bright torch. We see fairy tales as they are; not a dusty collection of old and irrelevant stories, but stories that travel, adapt and take on new meanings. She reminds us, on every page, why fairy tales are still relevant and important today. They have never existed in solitude, and Warner leads you through their connections to psychology, feminism, fantasy and the supernatural. She evaluates their history, their meaning, and the way they have woven (and been woven into) our very lives. 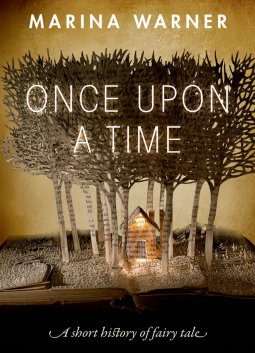 The chapters in Once Upon a Time are divided into themes. They range from the factual ‘Voices on the Page’ which introduces many of the tellers, writers and translators of fairy tales, to the barely constrained rally cry of ‘In the Dock: Don’t Bet on the Prince” which details the post-war feminist subversion of the fairy tale. Interestingly, the title references Jack Zipes’ book of feminist fairy tales Don’t Bet on the Prince. Here she celebrates, among others, the feminist works of theoreticist Ruth Bottigheimer, poet Anne Sexton and all-round-fairy-tale-feminist-superstar Angela Carter. One thing that makes this work so engaging is Warner’s refusal to stay neutral. In her dissent from fusty academic writing, she gives us sentences like “Aroused by Freud’s question, ‘What do women want?’, which lies at the centre of conjectures made by (mostly male) analysts, [feminists] seized hold of fairy tales and shook them till the stories choked, spat out the poison, and sat up ready for a different day… Fairy Tales were denounced as a blunt tool of patriarchy, the bourgeoisie, cosmetic surgeons, the fashion industry, physchoanalysts bent on curbing girls’ energies and desires.” (Loc 1522) I heard a whoop in there, didn’t you? The ideas in this book run deep. If you’re after light bedtime reading, this is no Disney-esque romp. Like tales of old, Warner’s book does far more that skim from ‘once upon a time’ to ‘happily ever after’. There is darkness with the light, and deliberation and passion in her words. While Warner’s writing isn’t hard to read, you’ll still need to put the book down every now and then, to take a walk or stare out the window, to allow the information to sink in. The path she leads us on is clear, but the forest is dense. Your head will fill quickly with new ideas and information. But don’t see this as obstacle. You will finish this book wiser about, and more in awe of, fairy tales, human nature and the many threads that tie our world together. Thank you to NetGalley and Oxford University Press for the advance reading copy of this book. It’s fabulous. I keep dipping back into it. The release date is Dec 1st I think. Probably should have mentioned that in the post!